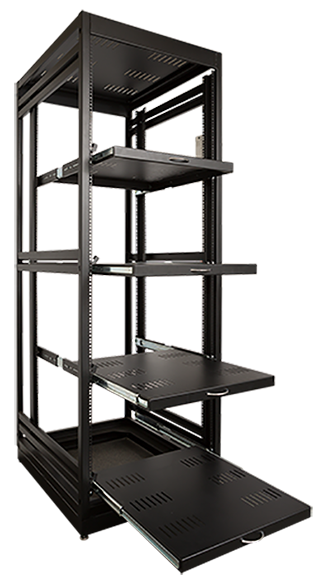 Task Handling Solution customized server racks are heavy duty work environment platforms that come with fixed or locking slide-out shelves (your choice). Built like a tank, they include standardized rack mount features and special seismic mounts. Not your typical static cabinet. Need something a bit smaller, but still extremely durable? Take a look at our “Hybrid Server Rack” below. 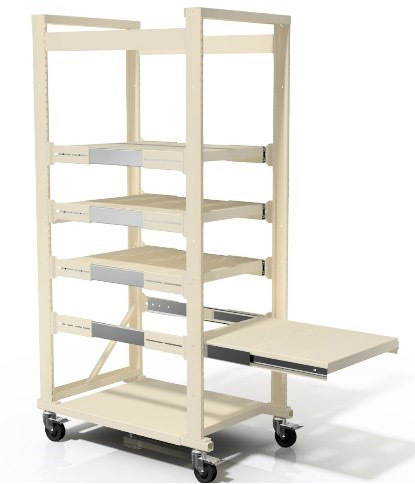 Heavy duty pullout shelves providing easy front and back access with locking feature for added security. Chassis can be mounted on 3 sides when it is not configured with side panels. Made of 12 gauge steel (as opposed to typical 14 gauge). Over-sized to accommodate various-sized server chassis. Special seismic mounts available for maximally secure immovability. Heavy duty pullout shelves providing easy front and back access with locking feature for added security. Available in either 72" or 82" heights. Ability to attach to THS modular workstation. Increases and maximizes your vertical space. Portability and versatility lowers your total cost of ownership. Build a THS Server Rack that suits your application needs. Begin filling out the form by choosing from a broad range of accessories. © 2018 SUMMIT Manufacturing, Inc. All Rights Reserved. Task Handling Solutions (THS) is a registered trademark.